These days I tend to give away or bin anything which I don't like so there's nothing that I really didn't get on with, but I probably won't repurchase the Kind Natured rosemary & mint shampoo or Schwarzkopf crystal shine conditioner as I prefer other alternatives. Being in a hot climate like India A'kin pure rose hydrating mist was a real handbag essential and I loved how cooling and refreshing it was during the day. Maybelline brow drama was great for adding some colour and definition to the eyebrows and I'm sad to have finished No 7 cream blush in Blossoming Pink. It was limited edition and I loved the gorgeous coral colour and how easy it was to apply. Skincare wise the two standout products this month were Lanolips and Colbert MD nourish eye cream. Made from pure lanolin, Lanolips is great if you have dry skin and I particularly liked it as a lip balm and cuticle oil. For a great everyday eye cream you really can't go wrong with Colbert MD. It really helped to keep dehydration and puffiness at bay and I found the lightweight formula so soothing, especially after a long day. As usual I've gone through a can of Batiste dry shampoo which is great for second day hair and I also really liked Dove intensive repair conditioner. A quick treatment which only needs one minute, it always left my hair feeling soft and smooth and it smells beautiful too. 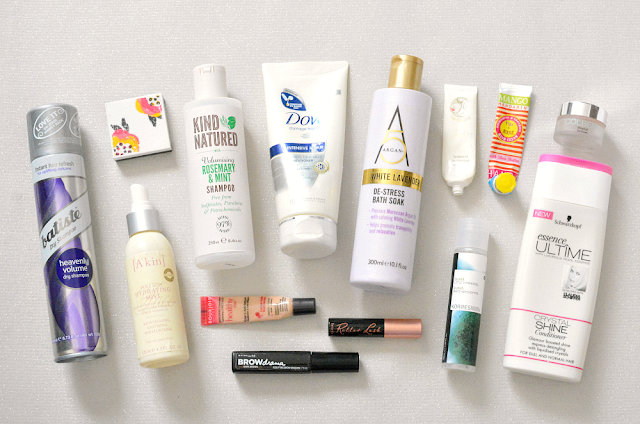 Did you get through many empties this month? What were your favourites? Clinique play with pop - A new look for Spring! Hyderabad photo diary - my first Indian wedding!